The very first steps into your home set off its visual and spatial experience. 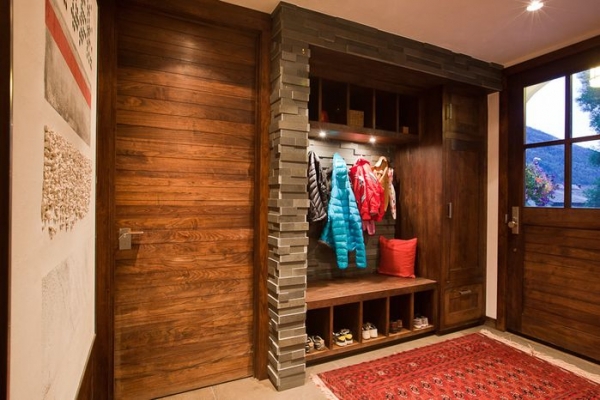 Your entrance hall is therefore more than a transitory vestibule, initiating a dialogue between you and your home. Designing a functionally and aesthetically viable entrance hall calls for some simple moves and an attention to detail, but even the smallest endeavor is sure to deliver big results. The clean and uncluttered design of this entrance hall transforms the incidentals into design accessories. Bringing joyful bursts of color to the décor, the various personal items stored feel welcome and at home in this design. For an elegant scheme explore a palette of charcoal greys and white in vivid geometric patterns. These work up quite a storm at your entrance, perfectly complementing the warmth and textural intricacy of wood. 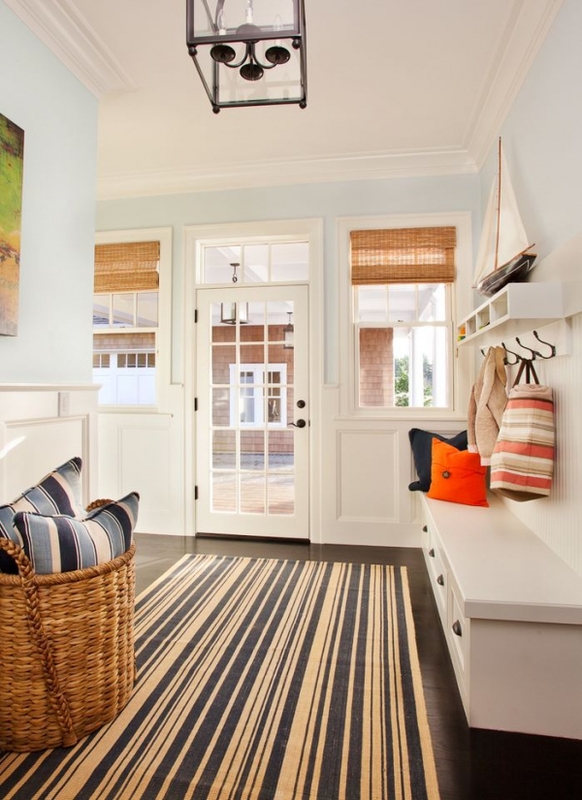 Use an area rug or other elements to subtly introduce a sense of directionality and movement into the space. Especially relevant in larger entrance halls and open planned spaces, these define the space without erecting any walls or partitions. Well thought our storage and a minimalist scheme can translate even the busiest of entrance halls into a visual spectacle. Accent lighting and crisp finishes keep the space light and moving. To bring a more traditional ambience to your entrance hall, explore large, bold patterns and textures in a range of creams, sepia and browns. Add a wicker basket for incidental storage to add a final quaint touch. A universal thumb rule for entrance hall ideas and design is to keep your storage off the floor; this keeps it clean, uncluttered and freely circulating. It also minimizes the chaos- visually and aesthetically, keeping your space neat and organized. Warm wood paneling, stonework detail and the intricate red rug captures the cozy vibes of a mountain cabin beautifully in this entrance hall. Carefully placed accent lighting enhances the textures and organic finishes, celebrating its unique aesthetic.